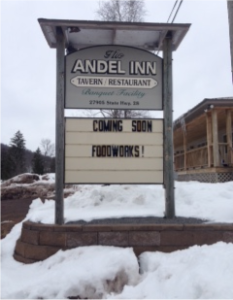 On March 11th, the Andes Planning Board, ever patient and focused, opened a Public Hearing on the purchase of the Andel Inn by the Delaware County Industrial Development Agency which proposes to install an agricultural incubator run by the Chamber of Commerce Development Foundation. The Board, Art Reed, Bill Palmer, Joanne Callahan, John Reynolds, Alex Adelson and Chair, Frank Winkler, gave the lively audience free rein to raise and debate their concerns. Tina Moshier, the Town Assessor, and three members of the Town Board were present as well as business owners, farmers, restaurateurs, real estate brokers and local citizens of all stripes. John Schulman, co-owner of Two Old Tarts & One Smart Cookie, raised the question of the new enterprise being tax exempt. This issue sparked a lively debate. The Town Assessor pointed out that since they had missed the deadline for tax relief in 2018 (March 1st), they would be paying full taxes this year. She promised that she was ready to sit down with the incubator and negotiate their tax status. Several farmers and small business owners pointed out that they had to pay even if it was a struggle, that the store (22% of the building) was a for-profit venture and should pay its “fair share” to keep the town healthy and the school open. Town Supervisor Bud Gladstone pointed out, “It is not unheard of for part of a building to pay a tax.” IDA chief Jim Thomson said he was prepared to “come up with a formula”. Maybe a “pilot” (Payment In Lieu Of Tax).